Imperial Japanese Navy (IJN) ground forces. They were amphibious assault troops, elite marines organized originally in brigade-strength units of about 2,000 men each. Rikusentai were an interwar advance by the IJN toward true marines, away from a World War I practice of simply forming shore parties from ships’ crew. 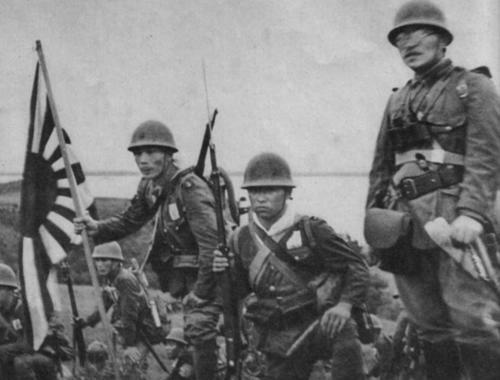 They first saw action at Shanghai in 1932, where their inability to hold ground drew more heavily armed and numerous Japanese Army troops into the fighting. They were again assaulted in Shanghai by elite Guomindang troops during the opening months of the Sino-Japanese War (1937-1945). Rikusentai were reformed into 12 battalion-strength units of about 800-1,200 men each in 1940, two of which trained for airborne operations. Rikusentai were directly controlled by fleet commanders, with only a few held in a small strategic reserve. They did not include other IJN ground forces such as port guards or base garrisons. They were instrumental in the “Hundred Days Campaign” of 1941-1942, which saw the Japanese advance across the Pacific, making multiple landings in the Dutch East Indies and Philippines, as well as on Wake Island, Guam, and dozens of smaller locales. Rikusentai also made airborne assaults on Celebes, Sumatra, and Timor. In the Solomons campaign and on New Guinea, Rikusentai continued to lead aggressive Japanese operations into 1942. Among these was a highly aggressive assault on Milne Bay on August 25, 1942. Thereafter they were engaged in Japan’s defensive perimeter campaigns, starting with defense of New Georgia. They were severely mauled in fighting on Guadalcanal. Rikusentai and naval base troops badly bloodied U. S. marines on Tarawa through fanatical resistance. U. S. marines and Japanese marines met again on Saipan, where the last Rikusentai parachute troops were wiped out. Rikusentai also fought U. S. marines on Iwo Jima, and in Manila Bay during the second Philippines campaign. By 1944 the elite character of the original Rikusentai units was badly eroded by repeated, bloody defeats. Scratch units were formed from ship’s crew and naval garrisons, a reversion to original IJN practice. These ill-disciplined late-war naval troops were responsible for awful massacres carried out by the Japanese in Manila in 1945, when they disobeyed orders to withdraw and instead slaughtered many thousands of civilians. The last marine-on-marine fight in the Pacific War was on Okinawa in 1945. In late August 1942, the Japanese continued their advance southeastward down New Guinea’s northern coast. Their destination was Port Moresby, initially denied to them by the Battle of the Coral Sea. Milne Bay, on New Guinea’s southeast tip, offered a harbor and good sites for airfields. The Australians and Americans had already built one airfield, and two more were under development, all part of the Allied defense of Port Moresby. On 24 August 1942, Japanese light cruisers Tenryu and Tatsuta, three destroyers, two submarine chasers, and two transports left Rabaul, transporting 612 naval troops of Kure 5th Special Naval Landing Force and 197 men of Sasebo 5th Special Naval Landing Force. Another 362 navy cadre and civilians of the 16th Naval Construction Unit were also aboard. These troops were to take the Allied airfields. The Japanese landed at Milne Bay on the night of 25 August and ran into trouble in the form of torrential rains, swamps, mud, and flooded streams. They also encountered many more Allied troops than anticipated. The Japanese navy had estimated Australian forces at Milne Bay at about a battalion, but the Australians had recently reinforced their garrison and had six battalions present from the 7th and 18th Australian Infantry Brigades under Major General Cyril A. Clowes. In and around the airfields were 9,458 Australians and Americans. The Australians also had 34 P-40 fighter aircraft. The Japanese landed 5 miles from the beaches where they had planned to land and 8 miles from their objective. They had no useful maps, nor did they have mechanized equipment to haul supplies inland. The Australian P-40s bombed and strafed beached supplies, oil drums, and barges and thereby destroyed most of the Japanese food stocks. Bombs from a B-17 bomber also damaged a Japanese transport unloading supplies. Another Japanese landing unit, actually part of the initial effort, never made it to shore. Some 350 Kure 5th Special Naval Landing Force troops aboard seven powered barges stopped at Goodenough Island for a break. Nine P-40s attacked and sank all seven barges, stranding the men. Japanese reinforcements (568 men of the Kure 3rd and 200 men of the Yokosuka 5th Special Naval Landing Forces) arrived on 29 August aboard three destroyers and three patrol boats. Despite an early setback, the Australians fought the Japanese to a standstill at the edge of the easternmost airfield. By 30 August, the Japanese at Milne Bay were short of supplies. Rain, mud, malaria, air attacks, and infantry combat wore them down. A final assault on the airfields during the night of 30 August failed. The Australians then counterattacked and drove the Japanese back toward their landing sites. The Japanese then decided to cut their losses and evacuate the survivors. As a consequence of the Allied air threat and because the Japanese needed only to evacuate men and not equipment or supplies, they employed two light cruisers and destroyers in the evacuation effort. They removed their wounded on the night of 4-5 September; the main body of the force departed the next night. One Japanese destroyer was lost during the withdrawal, sunk by U. S. aircraft. The Battle of Milne Bay was a tremendous psychological boost for the Allies. Until then, the Japanese had repeatedly defeated Allied ground forces. Japanese aggressiveness and spirit had previously triumphed over Allied soldiers and matériel-but not at Milne Bay. The Allied repulse administered to crack special naval landing forces helped convinced Allied soldiers that they could defeat the Japanese. References Bergerud, Eric. Touched with Fire: The Land War in the South Pacific. New York: Penguin Books USA, 1996. 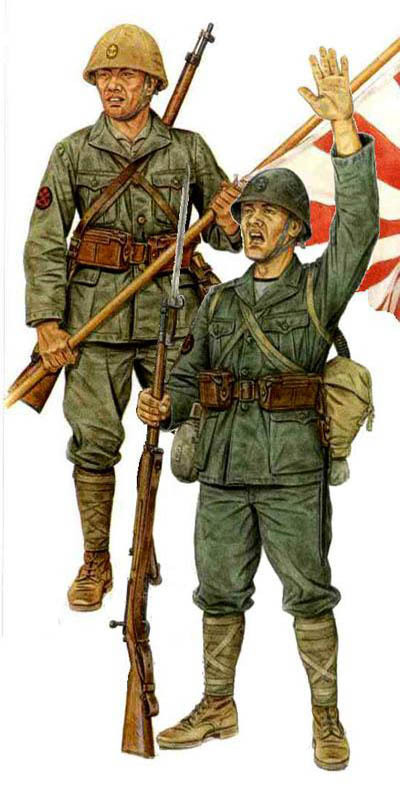 Dod, Karl C. United States Army in World War II: The Technical Services- The Corps of Engineers: The War against Japan. Washington, DC: U. S. Government Printing Office, 1960. Lacroix, Eric, and Linton Wells II. Japanese Cruisers of the Pacific War. Annapolis, MD: Naval Institute Press, 1997. Milner, Samuel. United States Army in World War II: The War in the Pacific-Victory in Papua. Washington, DC: U. S. Government Printing Office, 1957. Morison, Samuel Eliot. History of United States Naval Operations in World War II. Vol. 6, Breaking the Bismarcks Barrier, 22 July 1942-1 May 1944. Boston: Little, Brown, 1950. This entry was posted in Japan, Personnel by MSW. Bookmark the permalink.